The Fish Dies in the End ($0.99) by Gutenberg Nero is bland and repetitive. As an endless game, it neglects its most important feature: exciting gameplay. Not only that, but its audio grows stale quickly, and its leaderboard system is deeply flawed. 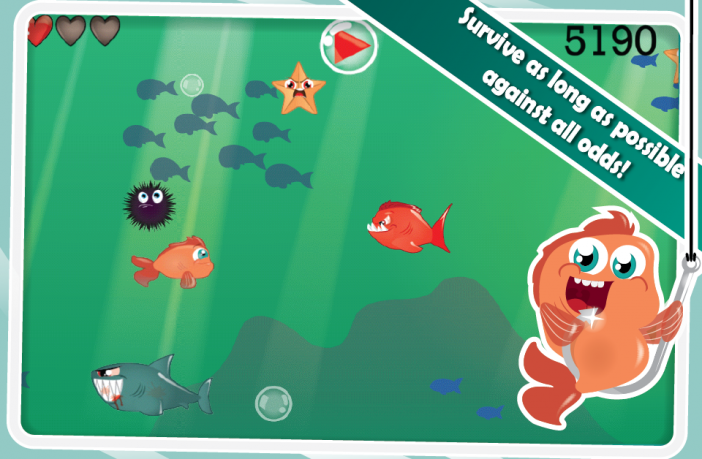 You are tasked with tapping on the screen to move a fish up and down, so that it avoids underwater obstacles. These involve grinning piranhas, snapping sharks, flapping flat-fish and other dangerous things like, erm, corals. The developer has also tried to spice up the gameplay a little through things like power-ups, a shark-attack scenario where sharks swarm the screen with uncalled-for aggression, and achievements. The app controls are responsive, and work well. Unfortunately, tapping on the screen also blocks your view of some of it – I found that I tapped primarily on the right of the screen, meaning that I couldn’t see some obstacles approaching until they were already a third of the way into the screen. Graphically, the game is reasonable, but could do with a bit of brightening up. The visuals occasionally crackle with a pseudo-film effect that seems entirely pointless and most obstacles switch between just two frames of animation, which seems slightly lazy. Backgrounds aren’t horrible but they’re not exactly breathtaking either. Much worse is the app’s audio, particularly the sound effects. Every time that you tap the screen, the game emits a highly irritating bubble-gulping sound. You tap the screen a lot, so unless you turn the sound effects off in the options menu, you’ll hear lots of highly irritating bubble-gulping sounds. Why’s the sound even there in the first place?! The soundtrack itself is fairly okay, but loops too obviously – there’s a marked difference between its end and start, so when it reaches the end of its loop it sounds more like a stalling car than a well-oiled machine. The app is flawed in other ways too. If you’re mid-way through the game and lock your device, you can’t pause the game upon returning to it. You can click on the pause button, but it snootily ignores you. The pause menu itself is… well, there isn’t a menu. No way to restart in-game, no way to change the sound volumes or other settings, and no way to quit to the main menu – if you want to do any of that, you have to either die or restart the app. 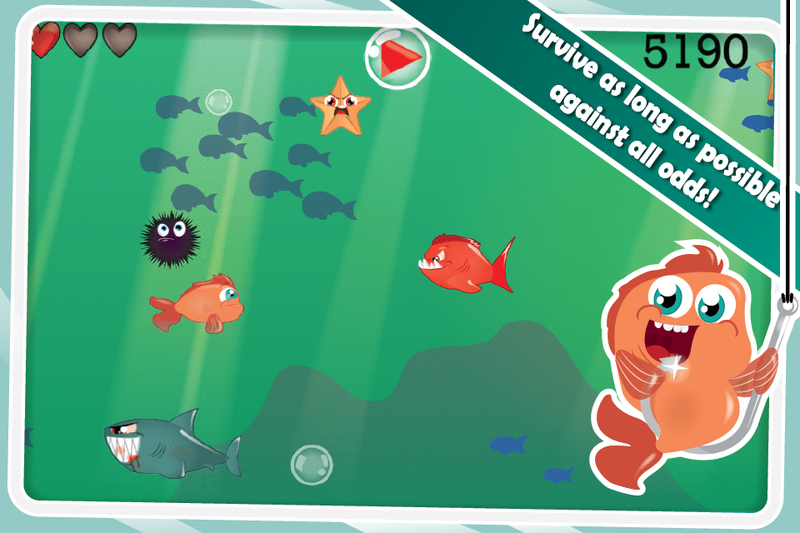 The Fish Dies in the End features leaderboard integration, but only includes one leaderboard, despite the game containing three difficulty levels. That means that your scores for ‘easy’, ‘medium’ and ‘hard’ are all given equal footing, despite 1000 being a lot harder to reach in ‘hard’ than ‘easy’. I was able to reach number 6 on the global leaderboard by getting a fairly high score on easy mode. There’s also no way to find out your highest score on individual difficulty levels. Overall, The Fish Dies in the End just isn’t that much fun. I find it hard to recommend when there are so many apps available that are more entertaining, more original and less flawed.